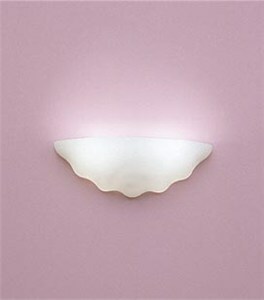 DESCRIPTION A scalloped, hand-blown glass diffuser characterizes this wall sconce, available in 2 sizes and 4 finishes. NUBIA P38 is ADA compliant; both versions provide upward and diffused illumination. Companion pendant, wall and ceiling designs are available. CONSTRUCTION A white metal backplate secures the glass diffuser and conceals the incandescent, halogen or fluorescent light source options. Mounts to a standard 4� junction box. LIGHT SOURCE 2 x 60 watts, incandescent, G-16, medium base (provided). 1 x 150 watts, quartz halogen, T-3, RSC/short (provided). 2 x 9 watts, compact fluorescent single, recessed contact (not provided). GLASS COLOR Satin White, Satin Amber, White Zebra Stripe, Amber Zebra Stripe.